Longtime bookseller and single mother, Claire Malloy has recently married her long term beau and moved out of her less than opulent apartment into a sprawling, newly remodeled house. Her daughter, Caron, is making plans for college. All of which leaves Claire with something she hasn't had in quite a while: spare time. When her attempts to learn French cooking start getting "mixed" reviews, she agrees to help Caron and her best friend Inez in fluffing up their college applications by volunteering as an ESL tutor with the Farberville Literacy Council. But her modest effort to give back quickly becomes a nightmare when she's railroaded onto the Board of Directors of the troubled nonprofit. Vandalism, accusations of embezzlement, epic budget problems, and a cacophony of heavily-accented English speakers are just the tip of the iceberg. Just as she decides that it might be best to extricate herself, Claire gets a frantic call from her husband, Deputy Chief Peter Rosen. One of the students, an older Russian woman named Ludmilla, famed for her unpleasantness, has been murdered in the offices of the Farberville Literary Council. 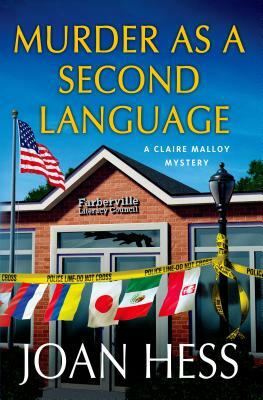 For the first time ever, Peter actually asks Claire for her help, and Hess brings a new depth to this fan-favorite series, in "Murder as a Second Language. JOAN HESS is the author of both the Claire Malloy and the Maggody mystery series. She is a winner of the American Mystery Award, a member of Sisters in Crime, and a former president of the American Crime Writers League. A long-time resident of Fayetteville, Arkansas, she now lives in Austin, Texas.